July 30th, 1926 to March 8th, 2018: Kay exemplified the attributes of her Midwestern upbringing with a busy schedule well into her 80s and 90s. Katherine Elizabeth Miller was born in Sharon, Pennsylvania on July 30th, 1926 to Anna Louisa Cox Miller and Walter Frederick Miller. She was the last surviving child of the Miller family which included her sister Anna Lucille and two brothers, John Walter and Walter Mathias. Kay's memories of growing up include time spent with her grandmother's sister and her Methodist Episcopal minister husband whose positive Christian influence was significant in her formative years. Kay's recollection of life on the farm was of hard work selling sweet corn and apples door-to-door and home-churned ice cream during the summers to help make ends meet. Kay graduated Valedictorian from New Wilmington High School in 1944 and earned a Bachelor's Degree in Sociology from Adrian College in Michigan in 1947. She met her future husband Herbert Benjamin Brown at Adrian and two years later they were married on June 11th, 1949. In 1950, Kay and Herb moved to Hudson, Michigan where they began their teaching careers and family. They lived and taught in Hudson for nine years and the first three of the Brown family children Steven Kent, Gregory Hal and Merilee Sue were all born in Hudson. In 1959 Kay and Herb moved to Hayward, California and the fourth of the Brown children Vaughn Walter was born three years later. In Hayward, Kay and Herb continued their careers as truly caring educators, with Kay first serving as a part-time teacher at Sequoia and Kimball Elementary Schools then a Reading Specialist at Eldridge Elementary School, Saint Clement, Saint Bede and All Saints Catholic Schools until she retired in 1983. Among the many memories of her life with Herb and the children in Hayward were the Sunday after church family outings throughout the SF Bay Area including memorable meals at Spenger's Fish Grotto in Berkeley and visits to the Japanese Tea Garden in Golden Gate Park as well as the cross-country trips they made to Pennsylvania and Michigan for reunions with family and friends. Both Kay and Herb were dedicated members of the First United Methodist Church in Hayward where Kay was active in the church's women's circle. Kay and Herb retired to Woodburn, Oregon in 1985 and became members of the Woodburn United Methodist Church where Kay was an active member of the church's women's circle. They also traveled in their RV to make visits to relatives and college friends. Kay and Herb greatly enjoyed their retired life together in the Willamette Valley and looked forward to many, many years ahead but sadly Herb died in 1990. In 2009, Kay, being the forward thinking kind of person she was, sold her home in Woodburn Estates and moved into Country Meadows Village where she greatly enjoyed the residential environment of social activities and trips. Kay exemplified the attributes of her Midwestern upbringing with a busy schedule well into her 80s and 90s, attending exercise classes, monthly book groups and trivia nights. She was an avid reader, player of board games and solver of crossword puzzles as well as a regular player of Words with Friends on Facebook with her children and grandchildren. Kay cherished time spent with her children, grandchildren and great grandchildren including holidays, her special birthday celebrations on the Oregon coast in July and annual summer trips with the Hayward girls, her daughter Merilee and her "second daughter" Merilee's childhood friend Cathleen Micheaels. 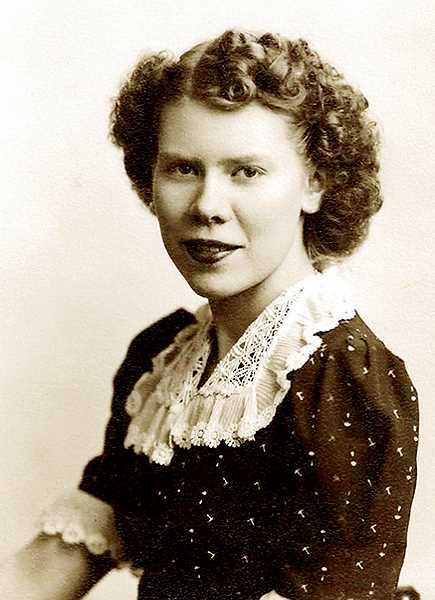 Kay had a genuine goodness and kindness—she made regular donations to a wide list of charitable organizations including the American Heart Association, Medical Teams International, Kids Alive International and Heifer International, regular visits to homebound elders and regular blood donations to the American Red Cross. She joined the P.E.O. Sisterhood (Philanthropic Educational Organization) in 2004 and was committed to its mission of supporting the advancement of women through scholarships. Kay was amazingly strong and courageous until the very end and was able to die at home as she wished with all her immediate family. She is loved and remembered by her family and friends, most especially by her four children, four grandchildren and four great grand children—Steve Brown and Virginia Kelly; Greg and Renae Brown and their sons Zachary and his wife Rebecca and Virgil and his wife Samantha; Merilee and Don Myers and their daughters Jenn, her husband Eric Tweed and their children Elliott and Ainsley and Ellen and her husband Jay Swanson and their children Finnley and Fiona; and son Vaughn Brown. A celebration of Kay's life will be held at the Woodburn United Methodist Church at 700 North Cascade Drive, Woodburn, OR 97071 on Saturday, March 24th, 2018 at 11:00 a.m. Donations in memory of Katherine "Kay" Brown may be made to the "P.E.O. Chapter DT" and mailed to P.E.O. Chapter DT, P.O. Box 174, Hubbard, OR 97032.